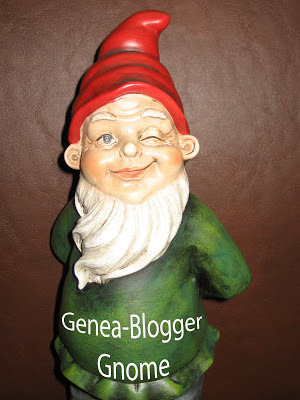 The Genea Gnome from GeneaBloggers paid this blog a visit! His owner, Terry Thornton, let him out for the day and he came over to the Research Journal. Be sure to click on the Gnome so you can see his home, the “Hill Country of Monroe County Blog”. You can follow the Genea-Blogger Gnome’s trail and see all the places he’s visited. Thanks for visiting us Genea-Blogger Gnome!